Meet The Man Who Sneaked Into Auschwitz This weekend marks the 70th anniversary of little-known World War II milestone. In September 1940, almost nobody knew about the horrors happening inside Auschwitz. A Polish army captain named Witold Pilecki got inside the camp and told the world. His reward? Anonymity and eventual execution. This weekend marks the 70th anniversary of a World War II milestone few people have heard before. It's the story of a Polish army captain named Witold Pilecki. In September 1940, Pilecki didn't know exactly what was going on in Auschwitz, but he knew someone had to find out. He would spend two and a half years in the prison camp, smuggling out word of the methods of execution and interrogation. He would eventually escape and author the first intelligence report on the camp. In the early years of the war, little was known about the area near the town Germans called Auschwitz. Poland was in a state of chaos. It was divided in half -- Nazi Germany claiming one side, Soviet Russia on the other. The Polish resistance had gone underground. 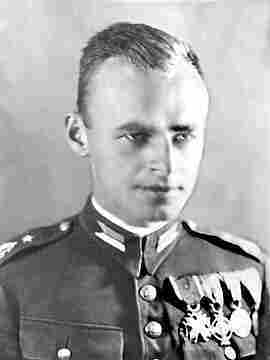 Pilecki wanted to infiltrate the Auschwitz camp, but he had difficulty getting commanders to sign off on the mission. At the time, it was thought of as POW camp. "They didn't realize the information from inside the camp was that vital," says Ryszard Bugajski, a Polish filmmaker who directed the 2006 film The Death of Captain Pilecki. Pilecki was eventually cleared to insert himself into a street round-up of Poles in Warsaw on Sept. 19, 1940. Upon arrival, he learned Auschwitz was far from anything the Resistance had imagined. "Together with a hundred other people, I at least reached the bathroom," Pilecki's Auschwitz report reads. "Here we gave everything away into bags, to which respective numbers were tied. Here our hair of head and body were cut off, and we were slightly sprinkled by cold water. I got a blow in my jaw with a heavy rod. I spat out my two teeth. Bleeding began. From that moment we became mere numbers -- I wore the number 4859." That was a small and early number for a camp that would -- one year later -- see numbers in the 15,000s. Alex Storozynski, president and executive director of the Kosciuszko Foundation, tells NPR's Mike Pesca that one of the early signs of Auschwitz's true purpose to Pilecki was the prisoners' diet. "The food rations were calculated in such a way that people would live for six weeks," Storozynski says. Here's Pilecki's description of what a German officer told him: " 'Whoever will live longer -- it means he steals. You will be placed in a special commando, where you will live short.' This was aimed to cause as quick a mental breakdown as possible." Pilecki was assigned to backbreaking work -- carrying rocks in a wheelbarrow. But he also managed to gather intelligence on the camp and smuggle messages out with prisoners who escaped. SS soldiers assigned Poles to take their laundry into town, and sometimes messages could be smuggled along with the dirty clothes to be passed to the underground Polish army. "The underground army was completely in disbelief about the horrors," Storozynski explains. "About ovens, about gas chambers, about injections to murder people -- people didn't believe him. They thought he was exaggerating." Pilecki also hoped to organize an attack and mass escape from the camp. But no order could be procured for such a plan from Polish high command. "We were waiting for an order, as we understood that without such one -- although it would be a beautiful firework and unexpected for the world and for Poland -- we could not agree to do that," Pilecki wrote. For the next two and a half years, Pilecki slowly worked to feed his reports up the Polish chain of command to London. "And in London," Storozynski says, "the Polish government in exile told the British and the Americans, 'You need to do something. You need to bomb the train tracks going to these camps. Or we have all these Polish paratroopers -- drop them inside the camp. Let them help these people break out.' But the British and the Americans just wouldn't do anything." Eventually, after nearly three years, Pilecki reported, "further stay here might be too dangerous and difficult for me." He planned an escape through a poorly secured back door in a bakery, where he'd managed to get a job. With a few other inmates, he ran into the night. "Shots were fired behind us," he wrote. "How fast we were running, it is hard to describe. We were tearing the air into rags by quick movements of our hands." After his escape, Pilecki continued to fight in the underground. But after the war, the Germans were replaced by a new occupying regime -- the Soviets. Pilecki was again asked to gather intelligence, this time on the ways in which the communists were establishing themselves in Poland. Filmmaker Bugajski explains, "He was actually captured by the communists, he was accused of espionage, and he was shot." There's a reason many Americans have never heard the story of Witold Pilecki's infiltration of Auschwitz. The communist regime in Poland censored any mention of his name in the public record -- a ban that remained in place until the fall of the Berlin wall. Only since then have documents emerged that reveal his story -- and that allowed Bugajski to accurately portray it in his film. That film ends with an epilogue, as the actor who plays Pilecki, Marek Probosz, walks outside the same prison where Pilecki was executed. "To our surprise, we see that this is free Poland," Probosz explains. "That you can talk about Pilecki, and no one is going to spit in your face or stab you with a knife." Today there is a street in Warsaw named after Pilecki. A square might be named after him, too. "Having a beautiful wife and two kids he loved dearly, he decided to leave them behind and go to Auschwitz." Probosz says. "Human beings were the most precious thing for Pilecki, and especially those who were oppressed. He would do anything to liberate them, to help them."